The Mary folio on display in 2009. The TLF collection at Plymouth City Museum, 2009. The Death and The Maiden folio on display, 2009. 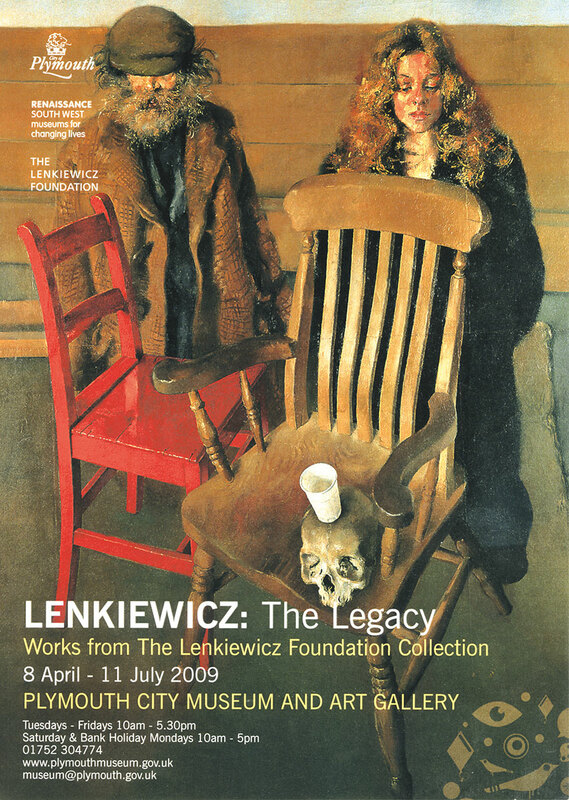 “The name of Robert Lenkiewicz is synonymous with large easel paintings and huge public murals, yet from the early 1970s he also produced an extraordinary archive of works on paper, otherwise known as ‘aesthetic notes’, which have rarely/never been on public display,” explains Francis Mallett of The Lenkiewicz Foundation. ‘Lenkiewicz: The Legacy’ will feature some of these framed aesthetic notes along with themed project notebooks and a selection of large easel paintings. In connection with the exhibition, the Museum will hold a lunchtime talk on Tuesday 12 May called ‘Robert Lenkiewicz: A Plymothian’s Perspective’. Guest speaker and local historian, Chris Robinson, will discuss his work and his legacy from 1.10pm onwards. Admission is free but tickets must be booked in advance and can be collected from the Museum or by telephoning 01752 304774. The Museum regrets that it will not be able to admit people to the talk who do not have a ticket. Due to the subject matter of some of the works on display, some visitors to this exhibition may find the content challenging. Oil on paper. 25 x 23 ins. Oil on canvas. 77 x 84 ins. Oil on canvas. 19 x 27 ins. Oil on canvas. 74 x 80 ins. Oil on panel. 10 x 11.5 ins. Cryla on board. 23 x 48 ins. Studies and notes relating to the painting Self Portrait: Death Bed. A journal entirely in the artist’s hand recording his relationship with his third wife, Mary, from their first meetings in 1978 to their honeymoon in Rome in 1981. The notebook was the centrepiece of Project 14 The Painter With Mary: A study in Obsessional Behaviour. The large folio was published in facsimile in 1998 as ‘The Mary Notebook’. One of the painter’s private diaries which span the years 1975-2002 recording appointments, meetings, sittings, and including photographs, press cuttings, occasional watercolours and sketches. Originally published as a booklet to accompany the Vagrancy Exhibition in 1973, this volume contains a facsimile bound in a leather folio. Pen, ink and watercolour. 15 x 13 ins. Drawing of a vagrant with associated notes. Pen and ink. 14 x 11 ins. Aesthetic Note. Watercolour, pen ink and bodycolour. Aesthetic Note. Watercolour, pen and ink, heightened with white. 10 x 8 ins. Aesthetic Note. Pen, ink and watercolour. 11 x 8 ins. Aesthetic Note. Watercolour heightened with white, pen and ink. 8 x 11.5 ins. Aesthetic Note. Watercolour and bodycolour. 16 x 11 ins.. Aesthetic Note. Mixed media. 11.5 x 8 ins. Aesthetic Notes. Mixed media. 13 x 6.5 ins/14 x 14 ins. ‘Mouse’ with Wool – Interior. The Father Eats His Son. Go away! Nearer! Physiology (Lover With Four Memories).